This Victorian era pub was originally known as the Northumberland Arms. It appeared in Sherlock Holmes story, The Adventure of the Noble Bachelor. In the books the pub is located right next to a Turkish bath that is frequented by the detective and his partner Dr. Watson. 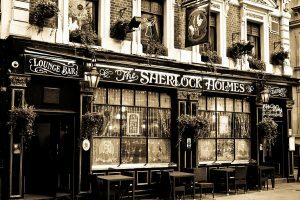 It is also suggested by fans of Holmes books that the pub was also the setting of part of The Hound of the Baskervilles. It is located right in the middle of London in Westminster. This means you can visit all the surrounding tourist attractions. These include Trafalgar Square, Big Ben, The Houses of Parliament, and Leicester Square. It is also within walking distance of Buckingham Palace, where Queen Elizabeth I resides. This is a must see for fans of Arthur Conan Doyle’s character: the most famous detective in the world, Sherlock Holmes. The bar has an extensive collection of Holmes memorabilia on display. There is even a detailed recreation of the character’s living room, complete with Victorian era items. There is outdoor seating which is great for those who want to drink in the summer. It also allows revellers to enjoy their beverage while immersing themselves in the busy hustle and bustle of modern London. The interior is cosy and quaint. The intimate atmosphere gives visitors an idea of what it would be like to enjoy a drink in the nineteenth century. They have a breakfast menu for those who want to visit early in the morning. They also serve a delicious Sunday roast. Their extensive selection of fine quality beers and ales have delighted customers for years. There are many different drinks on offer to satisfy a variety of tastes. The pub is known for it’s friendly atmosphere and the high level of quality service from the staff.